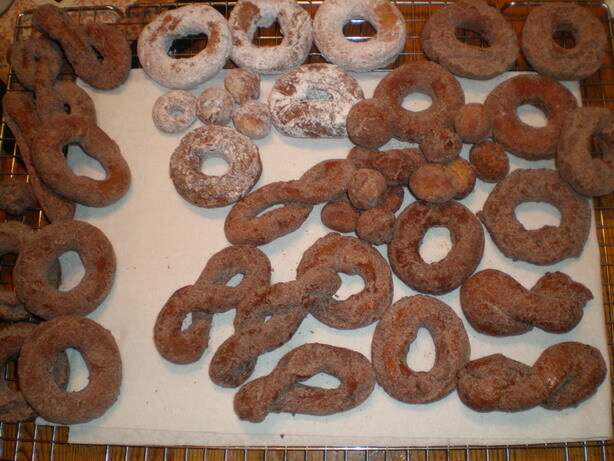 Does the idea of filling your entire house with the wonderful smell of freshly made doughnuts sound like a good idea? It does to me too! 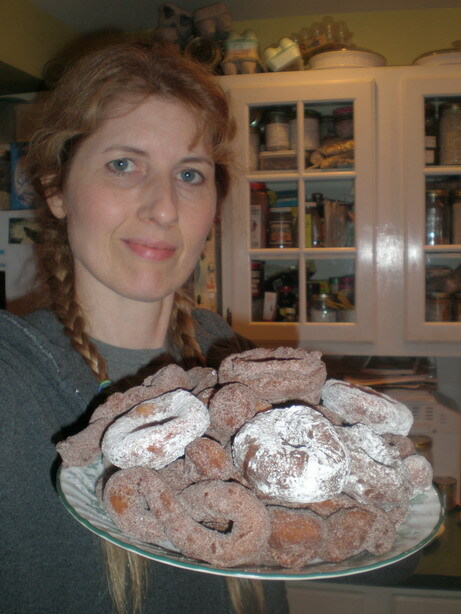 I’ve been itching to try a new recipe so here they are, “German Potato Doughnuts” from “1001 Muffins, Biscuits, Doughnuts, Pancakes, Waffles, Popovers, Fritters, Scones and other Quick Breads”. Whew, that was a mouthful! You can read the ingredients right off this picture. Some notes about my ingredients, I used organic eggs from the supermarket though I prefer them from someone’s farm. I have my own chickens though they’re not laying anymore. If you can I highly recommend finding a local person with chickens and buy their eggs, they will be a deeper, richer color and have more flavor than the ones in the supermarket, even the free range eggs. Farm raised eggs have a perfect balance of Omega 3 and Omega 6 fatty acids, very good for you! 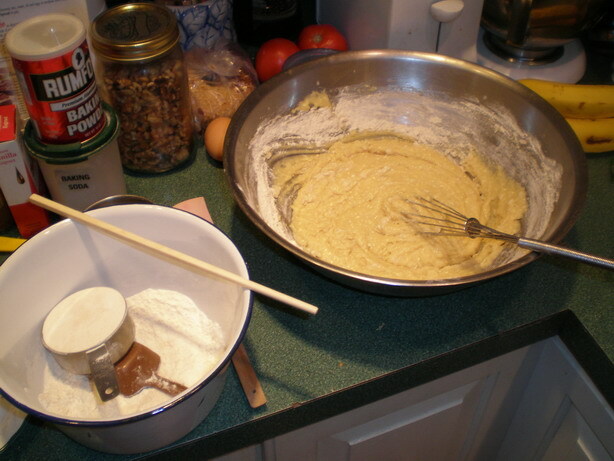 With the flour, I used 2 cups King Arthur’s Unbleached White Flour and 1 cup King Arthur’s White Whole Wheat flour. I try to sneak whole wheat in when I can though I find it can make a recipe drier…this combination worked fine. Mix the wet ingredients in a large bowl, you can use a standing mixer, I’ve just gotten in the habit lately of doing it by hand when I can. I figure it’s good exercise for the calories I’m about to eat! 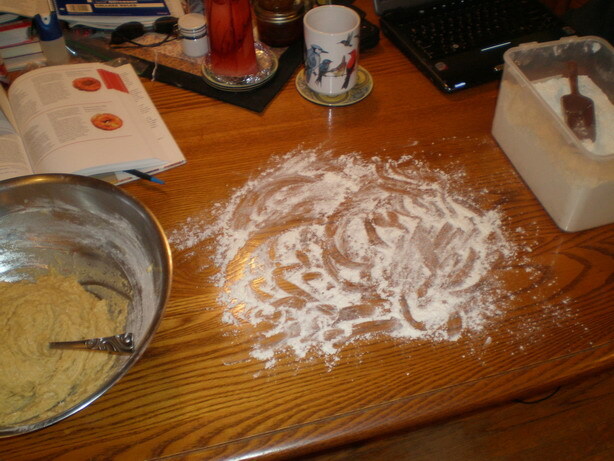 Measure the flour mixture a half cup at a time into a bowl to equal the full amount. 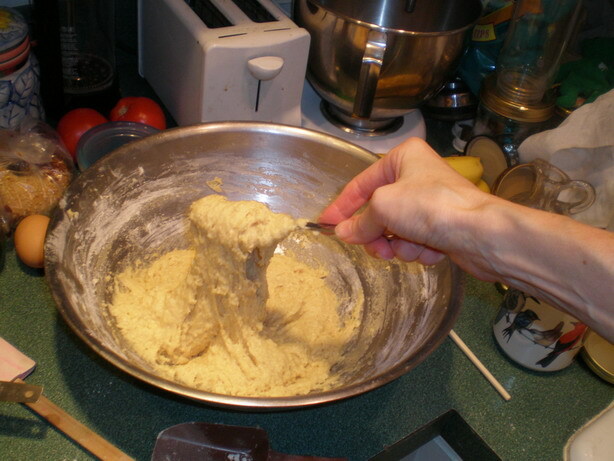 Then add to dough a half cup at a time and mix after each time. I use a plastic chop stick to level off my measuring cups, always have. 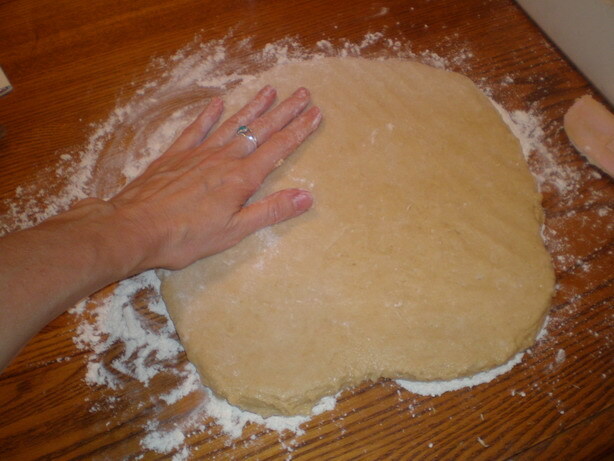 You can see the dough is pretty loose and sticky. Sprinkle flour liberally on a clean table top, keep flour handy, use your hand to do this, you’ll need floured fingers anyways. 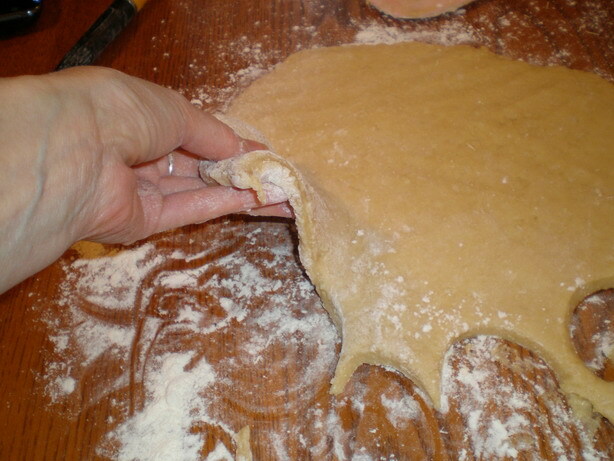 Gently pat the dough out, it’s a good idea to lift the edges as you do this to make sure it isn’t sticking. 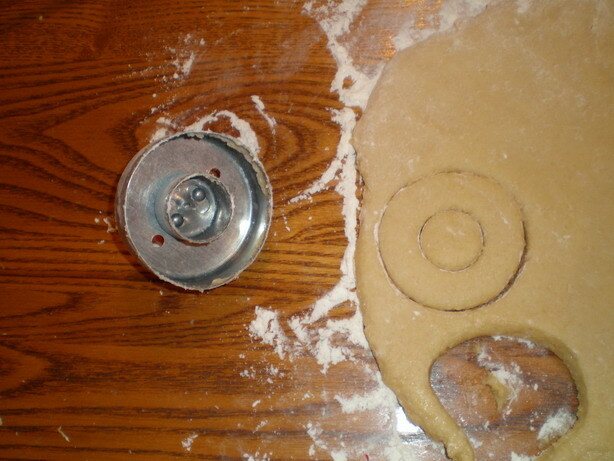 Dip the doughnut cutter in flour and give it a twist when you cut. Either it will stick a bit to the table and you have to lift it with a spatula or it will stick in the cutter and you have to give it a good shake to release it. 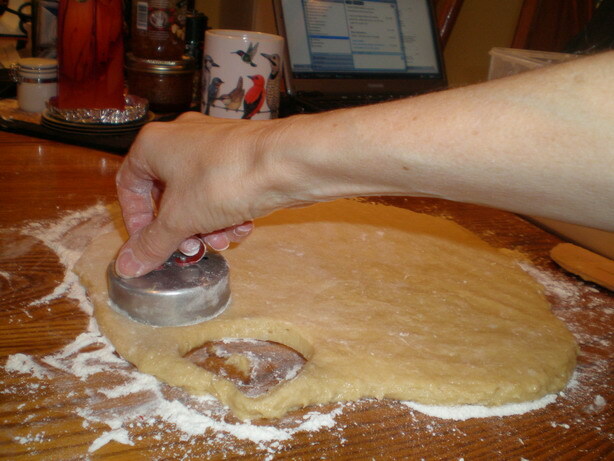 Occasionally clean the dough off the cutter, it’ll get a bit dried out and make it not cut cleanly. Don’t be afraid to lift the dough and sprinkle flour under it. 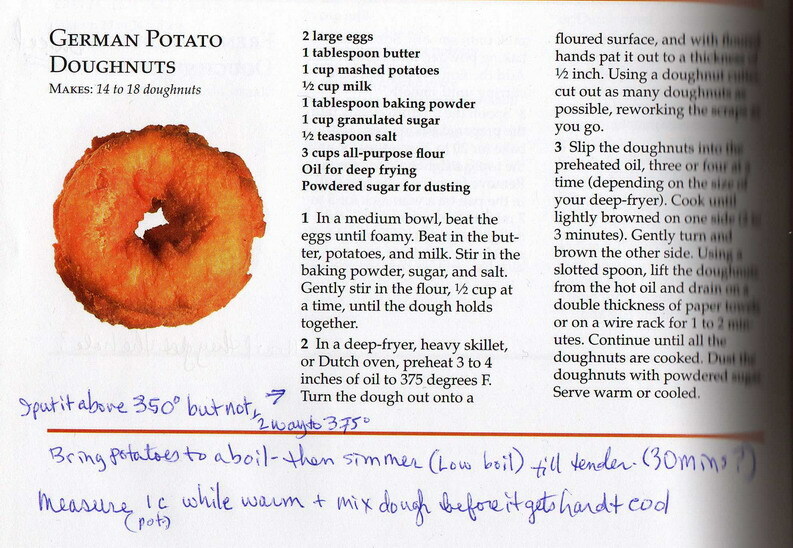 The dough will get sticky on the table while you are making other doughnuts. 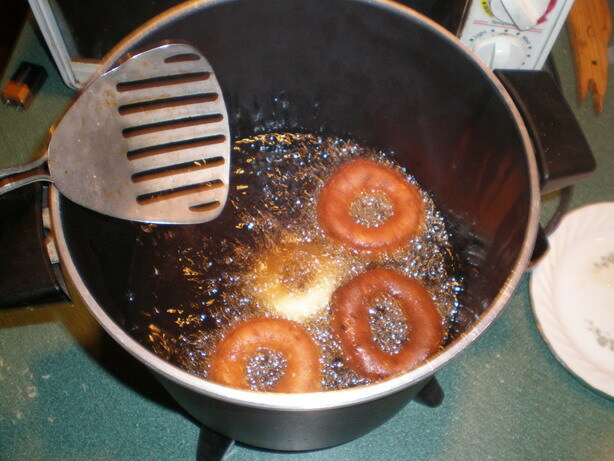 When you put them in the fryer use a spatula of some kind, lay a doughnut on the spatula then lower it right into the fat, tipping it. It should slide off. NEVER plop it in from above you’ll get splashed with hot oil. You can also lower them in by hand when you get used to it, the trick is to lower it right near the surface then let go quickly. They’ll sink to the bottom for a bit then float up, let them fry a minute and flip them to see how brown they are underneath. Let that side cook now. 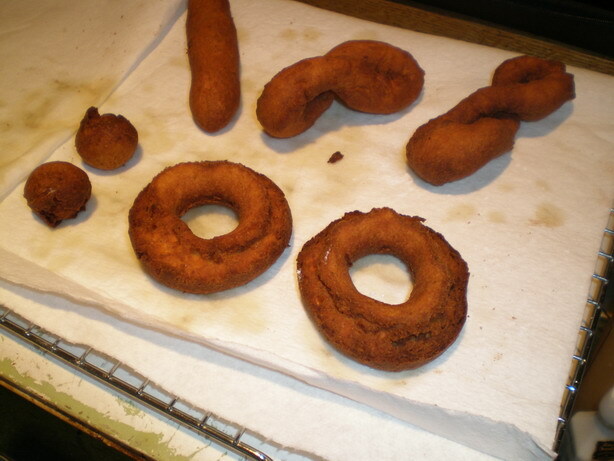 Little doughnut holes will just bob around and you can poke them to make them flip. The oil is shortening (like Crisco), buy a big can of it. You can take the oil when done and let it cool a bit, strain it then let it cool and scoop it back into the can and store it in the fridge. I would only re-use it once and if it’s gotten very dark don’t bother to save it. You can see I experimented with the shapes, I tried twisting some of them. If you don’t twist them enough they come undone. 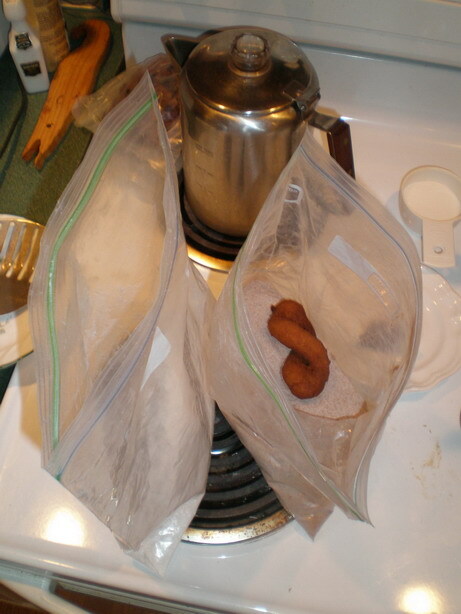 While a new batch is frying take your warm doughnuts and put them into a gallon size ziplock bag that has sugar and cinnamon in it. DON”T be stingy with the Cinnamon here, dump a lot in! Just roll the bag back and forth like sand and cover the doughnuts. You don’t need to seal it and shake them, just gently tip the bag back and forth. Lift them with your hand and shake the excess off. Let the have there final cool on paper towel lined cookie racks. Start the hot water for tea or coffee too!! * A note here, I took some of the dough aside in a separate bowl and added cinnamon, cloves (just a pinch) and nutmeg and mixed it into the dough. It tasted really good and would probably be better to add in dry ingredients, but I wanted some of it to be plain. This recipe gets a thumbs up from me! Those doughnuts looks delicious! Can’t wait to see your other posts! Thanks Caroline it’ll be fun sharing, I think my favorite part might be photographing the food when it’s done! haha…well then eating it of course!